At left: Map of Stellwagen Bank National Marine Sanctuary and Massachusetts Bay with backscatter intensity draped over the topography. Red indicates high-backscatter material, including coarse sand, gravel and rock. Green indicates sand. Blue indicates mud. The image shows the wide variety of sedimentary environments and the sharp transition between sediment types. Present and past disposal sites (white arrows) are characterized by high-backscatter material. Image courtesy of USGS. Population, infrastructure and investment continue to concentrate in the U.S. coastal zone. As of 1998, eight of the 10 largest American cities sat along the oceans or Great Lakes. Over 40 percent of new commercial and residential development occurs along the coast, and approximately 3,600 people move to the coast every day. More than 50 percent of the U.S. population lives by the coast today; by 2025 this figure is expected to reach 75 percent. The result is that more people are exposed to the risks associated with coastal settings, and pressures on coastal resources are intensifying. Threatened coastal resources include habitat for shellfish, finfish and waterfowl, and some of our most diverse and productive ecosystems. The coastal zone provides drinking water, mineral resources and energy supplies. It buffers storms, harbors ships and offers recreation. About 40 percent of U.S. jobs and one-third of the nation’s gross domestic product are generated in the coastal zone. It houses many of the nation’s threatened and endangered species, while over 40 percent of the U.S. National Wildlife Refuges are coastal. Clearly, it is in the national interest to assess and understand the status and trends of coastal resources, and to protect or restore those resources most susceptible to disruption by natural and human-induced change. Natural variability and the influence of human activity extend from the coastal plain across the continental shelf. Geologic investigations are critical for understanding the physical processes and controls in all coastal regions and exposing the influence of natural and human processes hidden beneath the ocean surface. 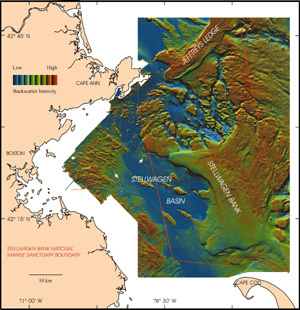 For example, mapping of detailed topography and backscatter throughout NOAA’s Stellwagen Bank National Marine Sanctuary and Massachusetts Bay reveals deep scours associated with icebergs grounding at the close of the last glaciation, bottom disruption by intensive fishing, and the location and dispersal of material dumped on the sea floor. The great variability in bed materials and topographic features apparent is a critical factor in the health and distribution of habitat and food for fisheries resources. Research in this complex natural setting must also address the ultimate impact of human activities that disrupt the physical environment and introduce waste materials and excess nutrients. Coastal erosion and storms: Nearly every coastal state (90 percent of the U.S. shoreline including the Great Lakes) is experiencing net, permanent erosion of its beaches and coasts, causing hundreds of millions of dollars in damage every year. Catastrophic storms, including hurricanes, cost human lives and tens of billions of dollars of property damage, and storms drive extensive changes in the coastal environment. Understanding the processes of storm-induced change, including flood-related delivery of sediments and nutrients into coastal ecosystems, is critical to improving both short and long-term predictions of coastal erosion and assessing the vulnerability of humans and ecosystems. Earthquakes on the coast: Earthquakes, and the landslides, tsunamis and subsidence events they trigger, pose a grave threat to coastal communities along the Pacific coast, in the Caribbean and throughout the Pacific islands. As populations increase, so does the demand to assess risk and vulnerability and to develop early warning systems. Losing wetlands, reefs and habitats: Coastal wetlands are storm buffers, waterfowl habitats, and sinks for sediment, nutrients and contaminants. As sea level rises, these wetlands are steadily disappearing. Seagrass beds and coral reefs, which are vital fisheries resources, are also declining in many areas under a complex combination of natural and human-related stresses. Threats to ecosystems and human health: Nutrient enrichment or eutrophication, caused partly by urban and agricultural development, spurs frequent oxygen depletion in over half the U.S. estuaries and in the Great Lakes, stressing or killing fish, shellfish and other biota. Toxic algal blooms are now common in every U.S. coastal region. Coastal land-use change can increase fluxes of bacterial and viral pathogens to coastal waters, contaminating shellfish and recreational waters. Each of these changes associated with increased development may adversely affect human health in ways that are poorly understood. Decline of critical species and spread of exotic species: Most coastal fish and wildlife species are less abundant now than they were a few decades ago. The declines are catastrophic in some cases — sea otters in western Alaska are now declining by 25 percent every year. Exotic species are disrupting ecosystems in the Great Lakes, San Francisco Bay and throughout coastal wetlands. Coastal aquifer degradation: Coastal aquifers, sole sources of drinking water for much of the nation’s coastal population, face twin threats: contamination from land-use change in recharge areas, and saltwater intrusion caused when over-pumping and reduced aquifer recharge, another symptom of urbanization, disrupt the water balance. Coastal ecosystems are, in turn, altered by changes in the quantity and quality of freshwater supplied through groundwater discharge. Toxic substances in coastal waters and bottom sediments: Coastal waters, sediments and bottom habitats are contaminated with toxic compounds in large portions of the U.S. coastal zone from Boston Harbor to the Great Lakes to remote areas of Alaska. The long-term mobility and fate of these contaminants, as well as how they disturb ecosystems, is poorly known. With continued development and changes in climate and climate variability, the risks these impacts pose are likely to increase. A comprehensive understanding of the dynamics and variability, both natural and human-induced, of coastal systems will provide the basis for developing and implementing policy. The answers will only come with coordinated efforts across all the science disciplines including all federal agencies with relevant research, management and regulatory missions. Research programs must also recognize that U.S. coasts are extremely diverse, both in their natural settings and human influences. Barrier islands, wetlands, estuarine systems, pocket beaches and coastal cliffs all respond differently to the variety of natural processes and human-induced pressures that affect the nation’s coasts. Each coastal system is, by the nature of its geologic setting and the natural processes that shape it, subject to a unique suite of dynamics and hazards. In turn, each coastal system demonstrates a unique sensitivity to the direct and indirect influences of growth and development. Understanding geologic settings and processes will provide the basis for both developing a global understanding of coastal systems and recognizing the uniqueness of local and regional systems. This understanding requires integrated scientific assessments and synthesis of multidisciplinary data, advanced modeling and forecasting, and decision support systems for land managers and policy-makers. Long Beach continental margin from 5-meter to 1,000-meter depths. 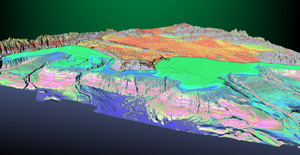 Accurate maps of bathymetery and substrate are required for numerical modeling of sediment and pollutant transport and tsunami propagation; assessing landslide potential; identifying ocean disposal sites; locating surface expression of faults; and finding benthic habitats. As coastal populations increase, so do their vulnerabilities to natural hazards. Hazards run the gamut from earthquakes and associated tsunamis, concentrated along the Pacific coast and Caribbean islands, to devastating hurricanes and coastal storms. The longer-term, persistent hazards of coastal erosion and sea-level rise in turn increase vulnerability to storms and flooding. These natural hazards threaten coastal communities and marine and terrestrial ecosystems. Earthquake hazards: Coastal communities are on the front line of the nation’s seismically active areas. Assessing risk and vulnerability means developing predictive capabilities for earthquake-induced tsunamis, landslides, ground shaking and coastal subsidence. 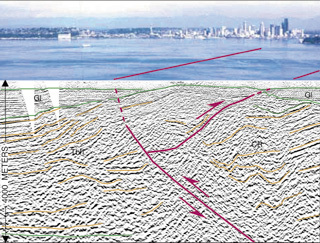 Coastal population centers on the West Coast, including Los Angeles, San Francisco, Seattle and Tacoma, are underlain by buried local fault structures and bounded by areas of potential slope instability. Marine and terrestrial geophysics — high resolution seismic; deep-crustal, multichannel seismic; ground penetrating radar; and deep borehole studies — are used to identify and understand these hazard-related structures. Research is aimed at determining the frequency and magnitude of tsunamis and subsidence events preserved in the geologic record. Hazard maps will require determining how susceptible soils and sediments are to ground shaking. Modeling generation and propagation mechanisms will aid in developing local tsunami warning systems and tsunami generation maps. Coastal storms: Hurricanes that hit the United States over the last decade rank among the most costly natural disasters in the country. The costs of storm damage go far beyond the immediate losses to structures and infrastructure and include social costs, long-term mitigation costs and environmental damage. Hurricanes Andrew and Iniki, which both made landfall in 1992, are enduring examples of the signatures major storms leave behind. These storms, which hit the barrier islands of Louisiana, the mangrove swamps of South Florida, and the coral reefs and pocket beaches of Hawaii and Guam, illustrate difficulties in predicting coastal response to storms. Different landforms and habitats respond differently to hurricane winds, waves and storm surges. In Louisiana, Andrew stripped sand from 70 percent of the barrier islands, exposing old coastal marsh. It left more than 80 percent of the oyster reefs behind the barrier islands smothered by 0.3-0.9 meter of sediment, and destroyed more than 70 kilometers of valuable dune habitat that had provided storm protection to estuaries, wetlands and coastal populations. By contrast, coastal erosion in South Florida was relatively limited, but damage to mangrove swamps and inland forests was substantial. Iniki caused massive beach-face erosion and overwash of the Hawaiian coastline that penetrated up to 300 meters, reaching elevations of nearly nine meters. More recently, Hurricane Floyd caused substantial shoreline erosion and massive flooding. The associated discharge of nutrients from large animal farms had a pronounced effect on the coastal bays of North Carolina. A comprehensive description of the geology, landforms and biota present in the coastal zone is critical for predicting storm damage. Applying remote mapping technologies provides the high-resolution data needed for regional and local assessments. The USGS is, in cooperation with NOAA and NASA, using precision airborne topographic (LIDAR) mapping to describe coastal systems and measure the effects of storms on beaches, wetlands and vegetated dunes. Early surveys allowed research teams to map the effects of the 1997-1998 El Niño on pocket beaches and coastal cliffs for much of the Pacific coast. Erosion and sea-level change: Most of the nation’s shoreline experiences long-term erosion from storms and, more persistently, sea-level rise, coastal subsidence and disruption of the natural supply and movement of sediment. The barrier islands and wetlands of Louisiana have historically eroded at rates that, in places, exceed 20 meters per year. Compaction of Mississippi River sediments results in subsidence rates 10 times the world rate for sea-level rise. As the barrier islands erode, valuable wetlands and oil and gas infrastructure are exposed to the attacks of waves. As channelization and flood-control modifications along the Mississippi River rob Gulf wetlands of sediments, those wetlands lose even more area as sea level rises. Geologists and biologists are working together to understand the balance that maintains wetland systems in response to rising sea level and changing sediment supply. Louisiana is perhaps the most dramatic case, but the balance of sea-level rise, sediment supply and transport processes drives coastal change throughout the country. In cooperation with NOAA and FEMA, the USGS is a partner in planning a new effort led by the U.S. Army Corps of Engineers to make a national assessment of shoreline status and trends. Detailed topographic, bathymetric, geologic and geomorphic mapping, coupled with an understanding of the driving processes, will strengthen our ability to predict the fate of our beaches and shores. Puget Sound. Image courtesy of USGS. The most obvious human impact on coastal and marine systems may be the introduction of pollutants, toxics, spoils and excess nutrients from land-use and development. Both point and nonpoint sources, directly released into a system or arriving as byproducts and spills, modify the natural environment. Research must address the transport, fate and impact of these materials. Hydrologic investigations are critical to understanding the changing flux of materials as they travel from inland sources, through surface and groundwater systems, to the coast. Pollution and dumping: Estuarine and coastal systems have been affected by waste disposal and release of toxics and contaminants. Byproducts of gold mining have permanently altered San Francisco Bay; toxic and radioactive dumpsites cover much of the Palos Verde shelf off Southern California; and remediating the level of pollutants in Boston Harbor has cost billions of dollars. The New York/New Jersey metropolitan area is among the most polluted coastal region in the United States. Its waters contain harbor dredge spoils contaminated with heavy metals and organic pollutants, as well as the largest deposit of sewage sludge in the nation. Additional wastes are carried directly from the land by regional currents. Understanding the ultimate fate of these materials requires a comprehensive knowledge of sedimentary processes and the interactions between sediments and contaminants. Determining the impact on benthic biota will require cooperative efforts between biologists, geochemists, oceanographers and geologists. Nutrient loading and toxic algal blooms: The decline of the Everglades/Florida Bay system, the prevalence of hypoxia in the Gulf of Mexico and Chesapeake Bay, and the increased incidence of toxic algal blooms have all been ascribed to increases in nutrient fluxes to coastal systems. In the Gulf of Mexico, nutrients arrive from drainage of much of the nation’s industrial and agricultural heartland. How well natural processes remove or sequester these nutrients and how well regulation mitigates their effects are largely unknown. For all coastal systems, identifying how much human development has altered natural conditions requires an understanding of the underlying natural variability. Ultimately, research must address the costs of these disruptions to ecosystems and human health. Fragile environments: The coastal environment hosts some of our most diverse and productive ecosystems. Nationwide, the vitality of coral reefs and wetlands has undergone a profound decline under a combination of natural and human forces. Assessing historic and current ecosystem health and function for these fragile environments is necessary for developing management strategies. The USGS and NOAA are pursuing an ambitious program to assess the distribution and health of coral reefs and to better understand the requirements for healthy coral systems. This effort will require novel applications of mapping technologies to provide regional and global assessments. The sea bed, which sustains many of our most valuable fisheries, has been greatly disrupted by dredging, dumping and intensive fishing. Detailed mapping of benthic habitats will help identify essential fish habitats and develop fisheries management strategies. USGS and NOAA researchers are investigating the linkages between these physical environments and fisheries resources. Understanding how sea-bed structure and processes support healthy marine communities is only one example of the need for collaborative research. The environmental, resource and public-safety issues facing the nation require coordinated research engaging all the earth-, life- and social-science disciplines. Nowhere is this integrated approach more critical than in the coastal zone, where land, water, habitats and society interact. With programs in the hydrologic, biologic, geologic, marine and mapping sciences, the USGS designs and implements integrated research programs in cooperation with other federal agencies and with academics. As the USGS increasingly focuses its resources on integrated research addressing coastal issues, geologic research will continue to be fundamental to its efforts. Resource managers and regulatory agencies need accessible and credible science. Multidisciplinary efforts will provide the scientific foundation for finding solutions to the complex problems that threaten the U.S. coastal zone. Haines is associate program coordinator and Williams is program coordinator, both for the USGS Coastal and Marine Geology Program.